Being asked to deliver a TED talk is an interesting experience (I’ll write about the actual experience of giving the talk at a later date.) There's lots of coaching from TED organizers on content, length, and delivery. I’ve had a private sessions with a voice coach and participated in a workshop on what do (and not do) with hands and body posture, and been told what to wear (and not to wear) on camera. I’ve met some of the other presenters at a live rehearsal in NYC and experienced impostor syndrome as I sat through a dinner with them afterwards. I’ve since recovered. I’ve tightened up my main points and editing out many stories--perhaps I’ll have a chance to share all of them in another, longer talk. The topic of my talk on April 26 is cohousing as an antidote for isolation. I highlight how we have become isolated due to the pursuit of the American Dream as well as social media, and how cohousing promotes social connection and could even save your life. 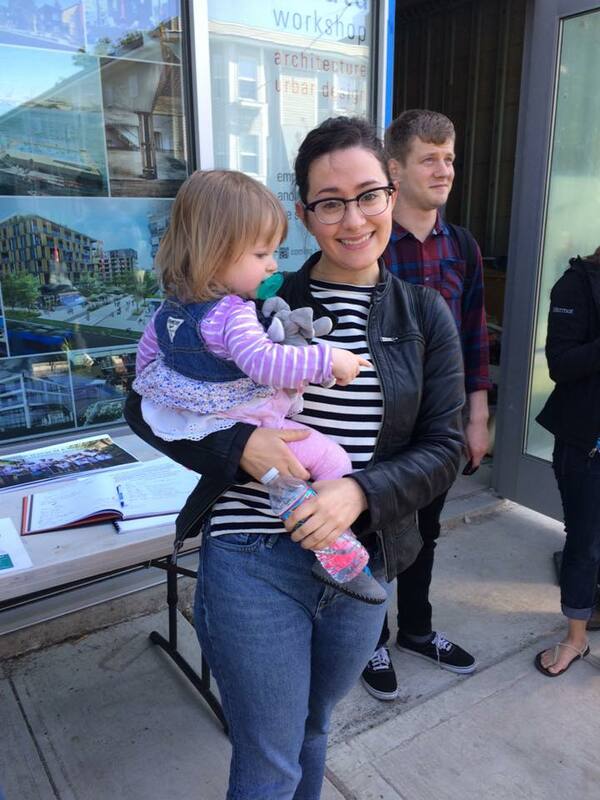 The Cohousing Open House was a reminder of what makes us so excited about living and working at Capitol Hill Urban Cohousing: designing a place for and by our urban village, where community is the lifeline of the project. 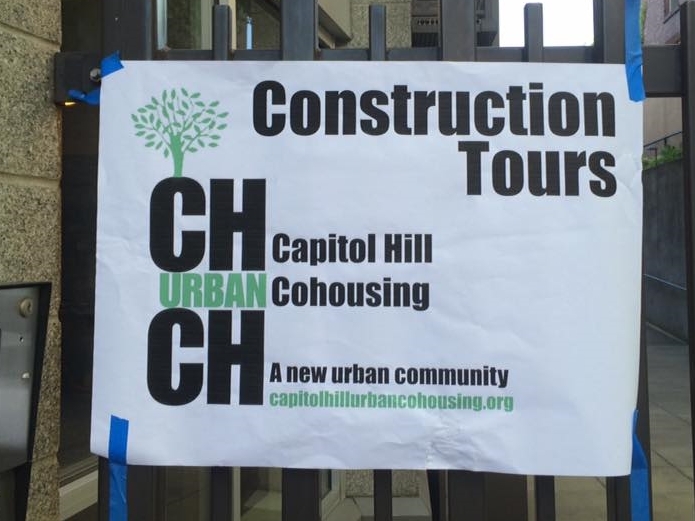 Last Saturday, April 30, 2016, members of Capitol Hill Urban Cohousing (CHUC) provided on-the-hour tours throughout the day to an estimated 90-100 visitors. We were delightfully surprised by the major turnout! At the same time, Grace & Sheila held a Cohousing 101 informational session nearby with 20 attendees for 1-1/2 hour long presentation and discussion about this type of intentional community. It probably isn't a surprise to anyone by now that we are eager to move into our new home - it's so close we can almost taste it. Likewise, delays that have caused our move-in to slip away further and further have been frustrating. We just want to move-in! But feeling the excitement of everyone who came by during the National Cohousing Open House was a welcome reminder that, despite all the delays, issues and challenges, it will all be worth it in the end. 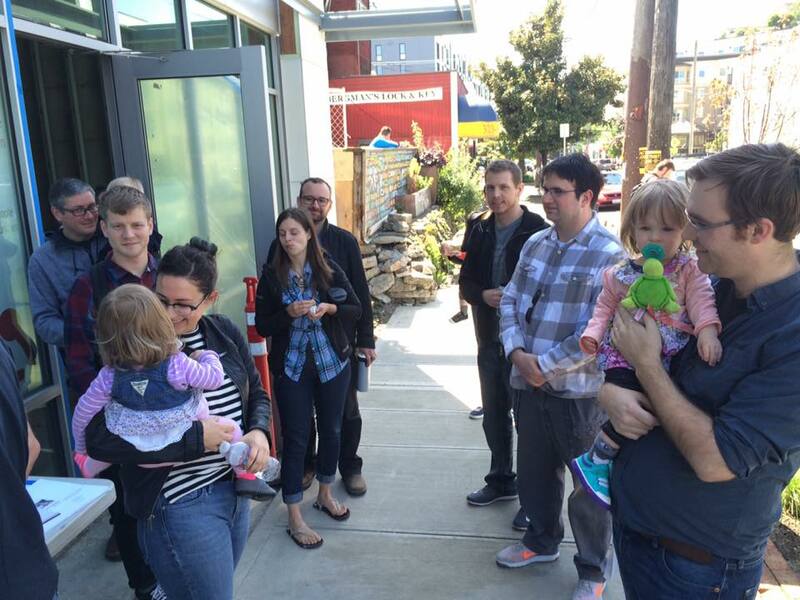 Many visitors had read some of the recent press (here and here), a group came down from Vancouver BC after visiting Bellingham Cohousing, some walked by and it caught their attention, while a few had a vision for a revolution (!) of resident-developed communities like CHUC. All visitors that we talked to and walked through the building understood excitement that residents feel for this intimately-scaled, community focused cohousing project. We heard our new building described as “…one of the most innovative, socially just and [hopefully] deeply influential projects completed in Seattle this year." We were flattered by this succinct yet thoughtful description and couldn't be more proud of what we've accomplished. ...we have ultimately pushed the envelope to innovate not only architecturally, but also socially. ...we created something that embodies the vision of our firm: design that empowers communities, is sustainable not only environmentally but also socially, and provides so many opportunities for second reads. ...we had a wild dream and actually made it happen! Here's to never thinking dreams are too big- cheers! Affordable housing in Seattle has reached crisis levels. And to be clear (since we do a lot of work in the area of subsidized housing), I’m not just talking about housing for the lowest-income households, I’m talking about non-subsidized, affordable-to-you-and-me type of housing – aka workforce housing. And for those who can afford to make housing choices and seek an intentional community-setting like cohousing, the costs can certainly be a barrier to entry. Although Ross doesn’t call it cohousing, the one and two bedroom homes that surround the central green and Common House, certainly has the appearance of a cohousing community. In fact, I would consider this a “retrofit cohousing” community because it wasn’t purpose built, but instead an adaptation of older buildings to accommodate the intention of living collaboratively. Architecturally, the homes are not fancy – the existing buildings were renovated and the grounds are a work in progress, evidenced by the care of the plantings and new interventions seen throughout. The innovation is really the model by which they were able to finance the purchase of the property and renovation with no bank financing. And the cost of purchasing the individual homes: $108,000 – $140,000. This short video tells their story. We hope it catches on and that others will learn from them to create their own retrofit communities. In mid-June I was invited to speak on Cohousing common house design in the UK. It was a great opportunity to visit the various different Cohousing schemes that exist in the UK, highlighting the diversity that is not as present in US Cohousing schemes. We visited LILAC in Leeds, which was a wonderful new build scheme with an alternative ownership model. My daughter made fast friends, visiting the community garden, and racing around the central pedestrian path. There was an ad hoc celebration for a family who had been granted amnesty, which we were able to participate in. And the community meal was divine – with members of two forming groups helping with the preparation. Dinner was followed by a presentation on common house design, with more than four forming groups in attendance. A visit to Laughton Lodge near Lewes in the south of England proved to be an idyllic day trip from London. The seaside town was the starting point of a trip to Laughton to visit a community founded by a deceased friend and Cohousing advocate, Sarah Berger. Laughton Lodge was formerly an old hospital for developmentally disabled people that has been adaptively refurbished to house 21 families. The grounds have been greatly improved upon, and the institutional housing has been transformed into generous residences with tall ceilings and ample daylight. The treehouse was a place for my daughter to make quick friends with other children visiting the community. Near central London, we visited Springdale Gardens, a small cohousing scheme for six families. The flag lot was tucked behind existing row houses. The founding residents shared their struggles with the Hackney planning commission and the difficulties of trying to obtain approval for their buildings that were to be hidden behind taller and higher density housing that face the public street. The residents had very high ambitions for sustainability and achieved them using a very modern aesthetic. This community was formed quickly around the desire to build in the City; accordingly they did not benefit from a long forming process. This, along with some struggles with their contractor, left them feeling burnt out, and the level of conviviality was lower than other communities visited. However, the residents with whom we met held high aspirations for future community-building endeavors. Finally we went to Lancaster Cohousing, the location of the seminar at which I was invited to present. This was built along a linear stretch of the Lune River and had the most ideal siting for solar strategies. The community achieved a high level of sustainable construction. Their common house was well considered - their architect had been given my common house design book as a resource during the design phase. Their community had meals several times a week, and a Daily Diners club ensured that there were meals on the other days for those who wished to participate. In addition to visiting these communities, I visited with many other nascent cohousers who were forming their communities - from Hackney to Brighton and other suburbs of London. They all had a great optimism for their projects and an idealistic enthusiasm to change their lives and change the world by building community. It gave me great inspiration to return home to finish out the last remaining months of our own construction on a truly urban Cohousing scheme in a very dense neighborhood of Seattle. Grace Kim is a founding principal of Schemata Workshop and the author of a book on Cohousing common house design. Schemata Workshop will be hosting a teen model-building workshop in collaboration with the Seattle Architecture Foundation about urban multi-family residential architecture exploring its various social and design issues. 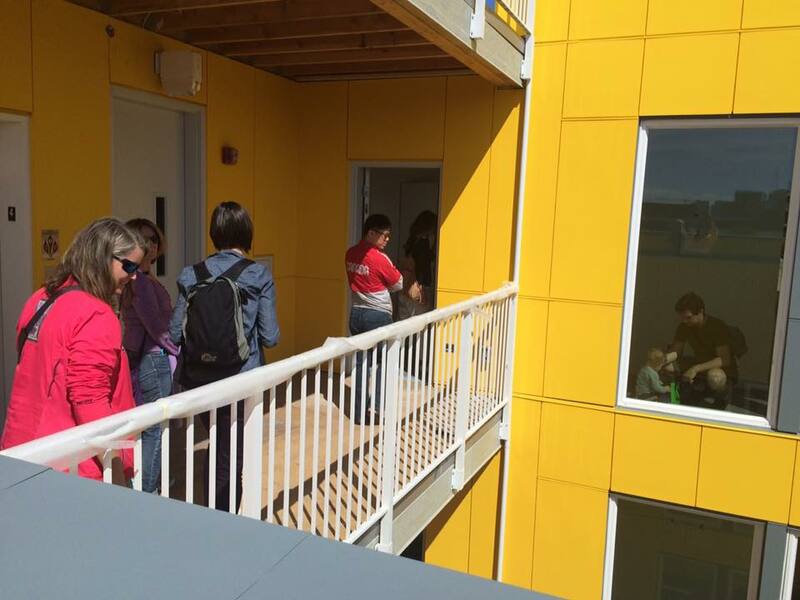 The participants will get a personalized tour of Jackson Place, a vibrant cohousing community in Seattle, as an example of a multi-family housing alternative. Grace, Will and Mira have been hard at work developing the curriculum alongside SAF and are excited to host. If you know a teen aged 11-16 who would be interested in partcipating in this workshop, you can find more information here. You may also contact Mira at mira@schemataworkshop.com.